As the year of WIPs continues, I have completed 3 projects that were started last year. Take a look at the lovely Tunisian Crochet scarf that I made with 2 hanks of hand dyed yarn. It is from Expression Fiber Arts, and it’s their Dewy DK yarn. As their website states: a mix of superwash merino wool (70%), nylon (20%) and silk (10%). It is super soft, lots of bounce and with the majority of it wool, it will definitely keep you warm. Thanks goes out to fellow knitting guild member, Merilyn Burnside, for teaching this class. The other WIPs is the South Bay Shawlette, a Lion Brand pattern. As you can see, it is a nice size for cooler days and nights. When I picked up the cake, the first thing that came to my mind was sunsets. And finally the Knit Shawl, Take Cover! By Katarzyna Baranska, a paid pattern on Ravelry. I used 1 hank of Malabrigo Mechita. I just need to block it as the top edge does curl and I want all the beautiful lace work to show through. For the necklace, the sample shown just make a chain of at least 140 stitches, slip stitch each chain, add a 2nd color, slip stitch those stitches, cut yarn, take another color or use first color, and slip stitch across. Sew both ends to back of hearts, and you have a cute necklace. 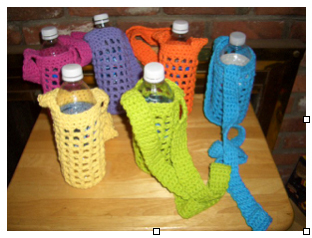 How about coffee cup cozies, 2 versions, one to wrap around your coffee mug and 1 to take with you for your favorite brew from the local coffee house. For the coffee cup cozy with handle, chain between 30 and 40 stitches. The length of the chain should wrap around the cup, but meet up to both sides of the handle, without touching. Half double crochet in 2nd chain from hook, hdc in each remaining chain. Turn, hdc in each stitch for 8 rows. Chain 1, single crochet along side of cozy, until you get half way up, about 3-5 stitches, chain 16, slip stitch into same space as the chain stitch, single crochet to the end and bind off. Add a cute button, I got this heart shaped button at JoAnn’s. For paper cup cozy, chain 30, slip stitch to first chain to form a circle, being careful not to twist chains. *Chain 1, hdc in each chain around, ending with a slip stitch in top of beginning chain 1. Repeat from *, for a total of 10 rounds. Bind off, weave in ends on inside. Attach heart and you are ready to go. Stitch 2 hearts together from the top, leaving the bottom point open and, add a little fiberfill stuffing, and place on top of a Valentine pencil and either glue it shut or tie it closed so the eraser can be used. Attach 2 hearts together, add crushed lavender and herbs and it becomes a sachet. Sew hearts together to create a cute bracelet. One Little Valentine Heart, many ways to accessorize just for Valentines Day. What will you come up with? See you soon, when I will have a review on a new product I found at my local JoAnn’s store.